With a blank centre, the Kenza Star Medal can take a logo and be personalised with a clear sticker on the back. This medal has finely embossed lines which form a star around the logo. This 50mm metal medal is available in a gold, silver and bronze. Excellent value, an all-in-one combination and great price. Cast in the time-honoured shape of the English Tudor Rose with detailed embossed grooving on the petals, the VF Tudor Rose Medal & Ribbon has a blank centre which you can personalise with your team or club logo. Alternatively, you can choose from our huge stock collection of FREE printed insert images. The medal is supplied with a FREE red, white and blue ribbon. The stunning Galaxy Medal is a metal die cut award forged from glazed metal. 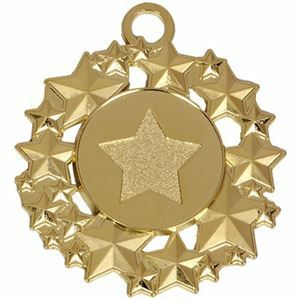 The medal comes in a choice of gold, silver or bronze and displays a burst of different sized stars all around the edge, framing a central disc. This disc can be personalised with a self adhesive logo insert, either with a personal design or with a FREE image from our huge library. This glossy medal provides premium styling for an exceptional price. The metal medal features an embossed laurel wreath running around the outer edge with a central round frame left clear upon which it is possible to add an optional logo insert. If personalisation isn't required the frame is printed with a large V for victory. The Credo Medal comes in gold, silver and bronze and is lacquered for a high shine finish. 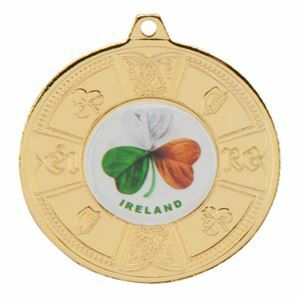 The perfect medal choice for any Irish themed event. The Eire Medal is embossed with images of shamrock, harps, Celtic knot patterns and the wording EIRE. The medal has a blank centre for you to personalise the medal with your club or team logo. Alternatively, you can choose from our huge stock collection of FREE printed insert images. Excellent value buy. Excellent value buy. The Balmoral Scottish Medal is embossed with classic Scottish symbols: the courageous lion, the endurance thistle and time-honored Celtic knot patterns. 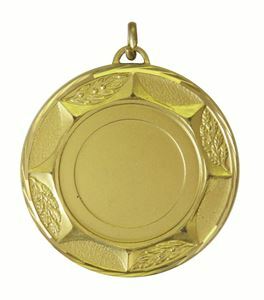 The medal has a blank centre for you to personalise the medal with your club or team logo. Alternatively, you can choose from our huge stock collection of FREE printed insert images. Ideal for any Scottish themed medal event. The Four Province Medal is embossed with images from the flags of the four provinces: Connacht, Munster, Leinster and Ulster. 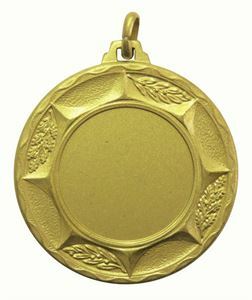 The medal has a blank centre for you to include your club or team logo. Alternatively, you can choose from our huge stock collection of FREE printed insert images. Excellent value buy. Offered at an attractive price. Embossed to a high standard, the Quality Sunburst Medal features an embossed sun ray surround, decorated with laurel and oak leaves. There is a blank centre for you to include your logo. Alternatively, you can choose from our huge stock collection of FREE printed insert images. Offers you good value. 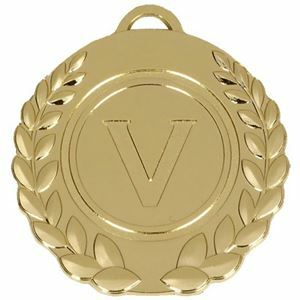 Intricately embossed to a high standard with an antique leafy surround, the Quality Vine Medal is a great value choice. 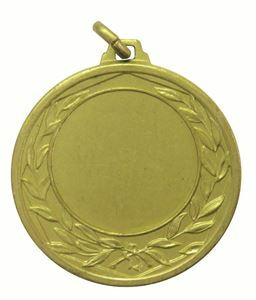 The medal has a blank centre for you to include your club or team logo. Alternatively, you can choose from our huge stock collection of FREE printed insert images. Offers great value. 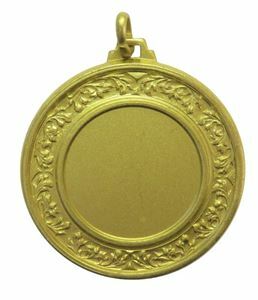 The Quality Wreath Medal is embossed to a high standard with a laurel wreath and a blank centre to allow you to personalise the medal with your club or team logo. Alternatively, you can choose from our huge stock collection of FREE printed insert images. The Heavyweight Teardrop medal is a superb tear shaped metal medal available in a choice of gold, silver and bronze finishes. This premium medal has a matte style and smooth curved edges surrounding a 25mm circular centre. The centre of the medal has been designed to display a standard or printed logo insert, tailoring each medal to your presentation needs. The top of the medal features a cut out to allow you to attach your choice of medal ribbon. This superior quality Faceted Sunburst Medal, is cast from brass which gives it a weightier feel and renders the diamond faceted edges in a shiny two toned finish. The surround is embossed with oak and laurel leaves. The medal is embossed with a sunburst and blank centre to hold your logo. Alternatively, you can choose from our huge stock collection of FREE printed insert images. 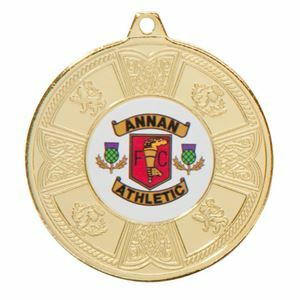 Foster team loyalty and reward your best players with these great-looking football medals adorned with your logo. You can choose to award individual football medals to the best goal of the season or most committed player, or bestow them on the whole team for a well-played game or sensational football season. If your budding players are just at the start of their careers, your medal might be the first in a long line of future awards! Football medals customised with your logo are so much more special than a standard, generic award. 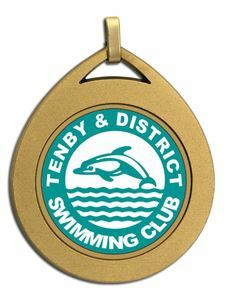 A unique medallion that you won’t find anywhere else, your own club or school medal will be something for your team to treasure. 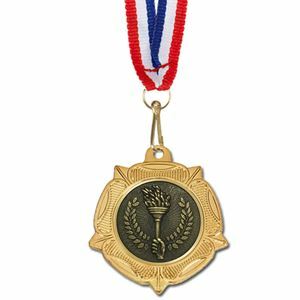 Buy our football medals individually or in bulk for every team member. And when the game is won, don’t forget to take team pictures of your players sporting their logo medals!